The new Ball State University president and his wife are creating a scholarship to benefit students at the local city high school. 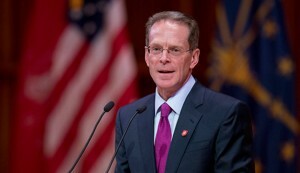 In his installation speech, Ball State President Geoffrey Mearns put a spotlight on financial troubles at Muncie Community Schools. The corporation’s multi-million dollar deficit came to statewide attention this year when the Indiana General Assembly labeled it “fiscally impaired” and assigned an emergency financial manager to turn it around. Mearn’s personal contribution is a new scholarship fund for Muncie Central High School graduates that are first-generation college students. The Mearns/Proud Family Scholarship is named for Mearns’ and his wife Jennifer’s family and comes with a commitment of $100,000 from the couple. Ball State Board of Trustees chairman Rick Hall says with extra commitments from trustees and the Ball State Foundation Board of Directors. “We have more than $280,000 provided to endowed scholarships to first generation college students from Muncie Central starting in 2018,” Hall says. A recent survey by the Sagamore Institute found that less than a quarter of Muncie residents hold a college degree, making many Muncie Central students eligible for the scholarship.